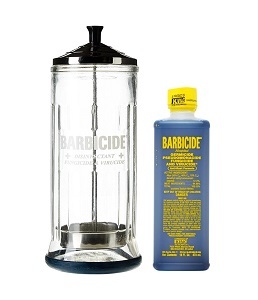 Barbicide Disinfecting Jar has become the iconic symbol for safety and cleanliness in the barbershop! Still made with the same quality as it was 75 years ago, our jars come in three sizes to meet your needs for disinfecting all sizes of implements. Barbicide is known worldwide as the ultimate product for EPA registered, hospital grade disinfection in salons, barber shops and spas. Barbicide Disinfectant, the iconic blue liquid, is trusted and effective earning its reputation for creating a safe and clean salon. Available in 2oz, pint, ½ gallon and gallon containers, Barbicide concentrate is economical for use in every salon, barbershop and spa!